The University of San Diego Chamber Music Ensemble provides an opportunity for students and community members from all disciplines to discover the wonders and delights of playing chamber music. Initiated by Angela Yeung, PhD, in the Spring semester of 1995, the USD Chamber Music Ensembles have helped students and community members from all disciplines discover the wonders and delights of playing chamber music. The various chamber groups perform at venues that are more suitable for smaller ensembles rather than for the entire orchestra, such as school and community visits. The chamber groups perform in San Diego and take an annual trip to perform in Tijuana. USD students may enroll in the USD Chamber Music Ensembles for a credit each semester repeatedly without limit upon successful audition. All musicians not affiliated with USD are welcome to participate if positions are open. Please contact Dr. Angela Yeung for an interview and audition. Regular rehearsals are held Tuesdays and Thursdays from 10:45 a.m. - 12:05 p.m. during the fall and spring semesters. Rehearsals outside the regular class time may be arranged under special circumstances. 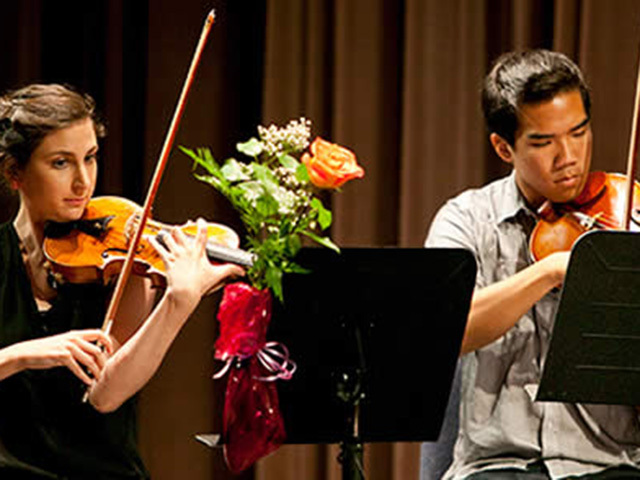 The University of San Diego also hosts an annual weekend of chamber music festival (Winter Chamber Heat) in February and a week of Summer Chamber Music Festival in July.